EUPEC‘s Reel-to-Reel containerized mobile plant is unique in the market today. It was conceived and developed in-house to provide anticorrosion coating of reeled pipes used in the fabrication of deep offshore umbilicals and bundles. This fully automatic system is able to coat 1” to 3” small diameter reeled pipes with three layer polypropylene coating (3LPP) in a continuous process using cross head extrusion. 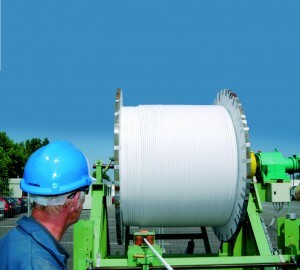 The reeled pipe length can be up to 4,000 metres. Designed as a portable « plug and play » tool, the plant can be modified in two weeks and transported to any yard in the world.